The R-78xx-Series high efficiency switching regulators are ideally suited to replace 78xx linear regulators and are pin compatible. The efficiency of up to 97% means that very little energy is wasted as heat so there is no need for any heat sinks with their additional space and mounting costs. 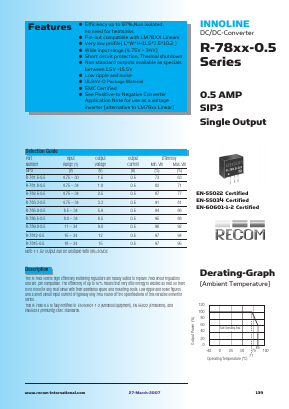 Low ripple and noise figures and a short circuit input current of typically only 7mA round off the specifications of this versatile converter series. This R-78xx-0.5 is fully certified to EN 60601-1-2 (Medical Equipment), EN 55022 (Emissions), and EN55024 (Immunity) EMC Standards. K7801M-1000 WIDE INPUT NON-ISOLATED & REGULATED SINGLE OUTPUT View MORNSUN Science& Technology Ltd.
K7803T-500 WIDE INPUT, NON-ISOLATED & REGULATED SMD PACKAGE SINGLE OUTPUT View MORNSUN Science& Technology Ltd.
K7801T-1000 WIDE INPUT, NON-ISOLATED & REGULATED SMD PACKAGE SINGLE OUTPUT View MORNSUN Science& Technology Ltd.
K7803-500 WIDE INPUT NON-ISOLATED & REGULATED SINGLE POSITIVE/NEGATIVE OUTPUT View MORNSUN Science& Technology Ltd.
IB0505S-2W 2W, FIXED INPUT, ISOLATED & REGULATED SINGLE OUTPUT DC-DC CONVERTER View MORNSUN Science& Technology Ltd.